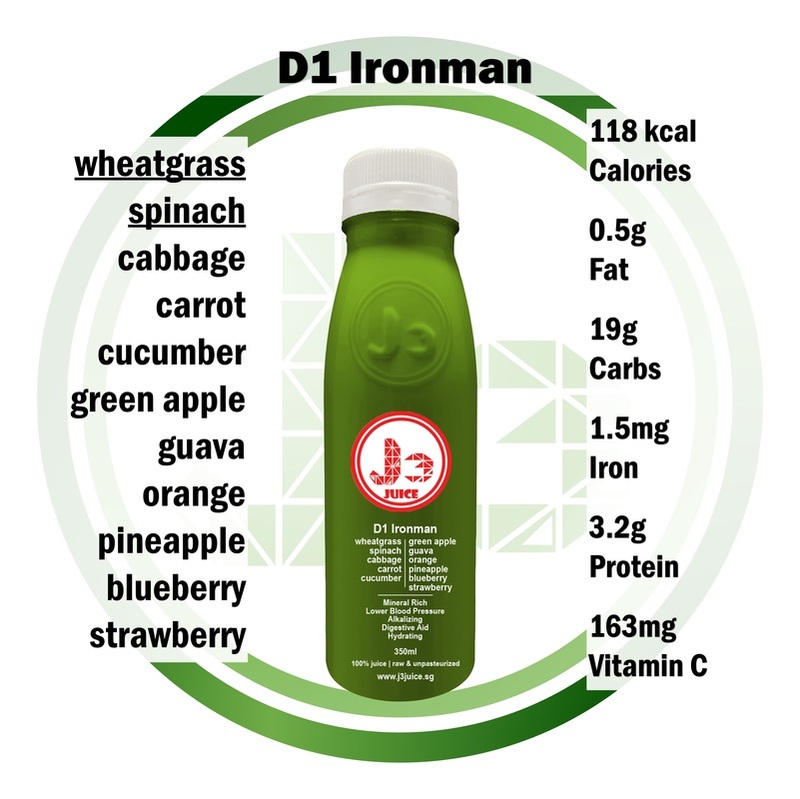 Ingredient also include: carrot, cucumber, cabbage, green apple, pineapple, guava, blueberry, strawberry and orange. 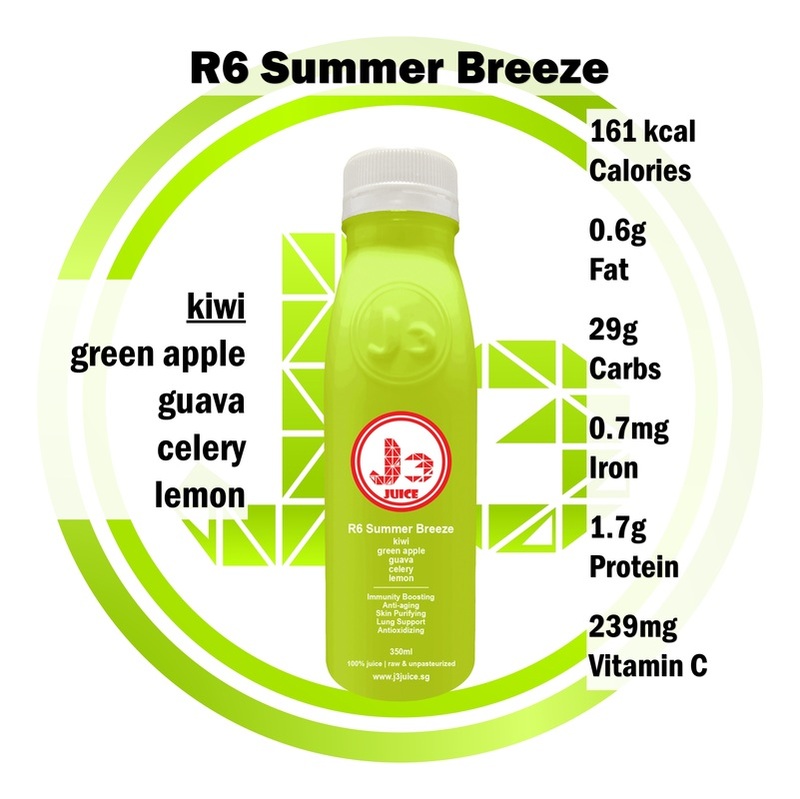 Taste: Green with refreshing taste from pineapple. 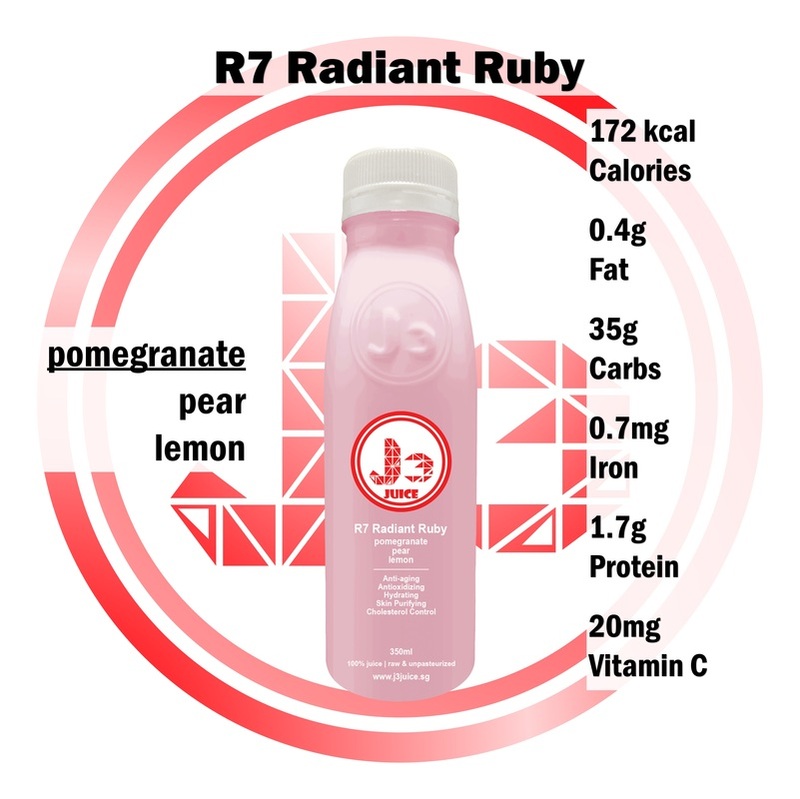 Ingredient also include: red apple, celery, pear, starfruit, orange and lemon. Taste: Beetroot taste with sweetness from red apples, taste is enhanced with a pinch of lemon. Ingredient also include: broccoli, mint, cabbage, lime, cucumber and celery. 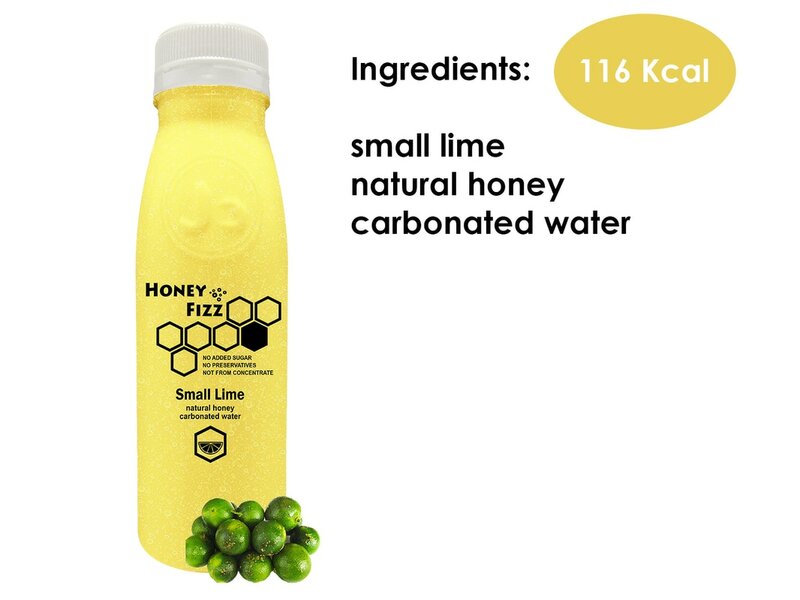 Taste: Pure vegetable juice with a pinch of small lime and mint to enhance the flavours. 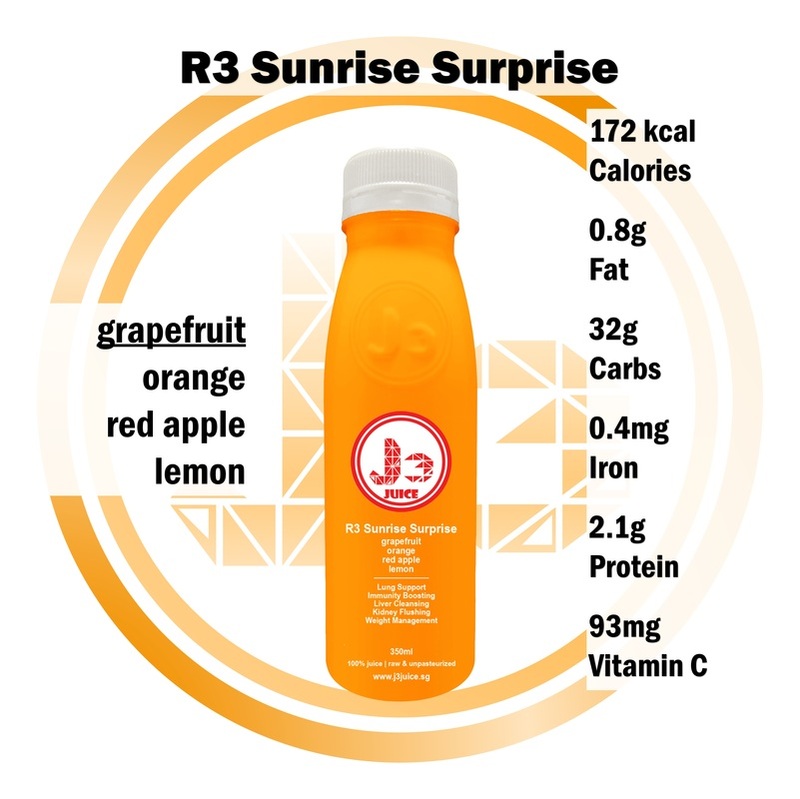 It has the lowest fructose among J3's juice. Ingredient also include: celery, carrot, red apple, mix grapes, pineapple, orange and pear. 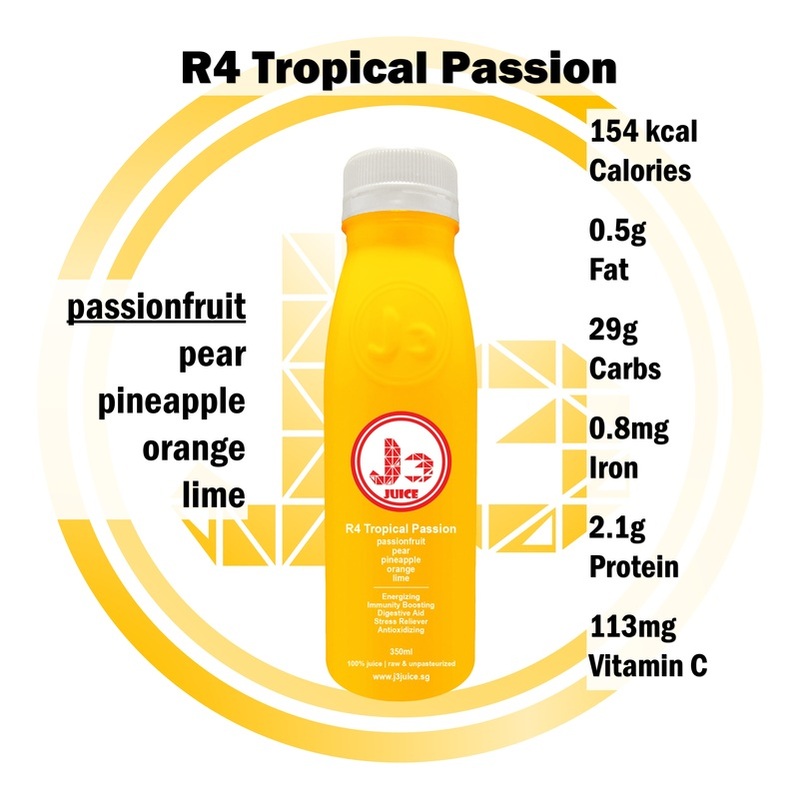 Taste: Sweet and refreshing taste from red apple and pineapple. 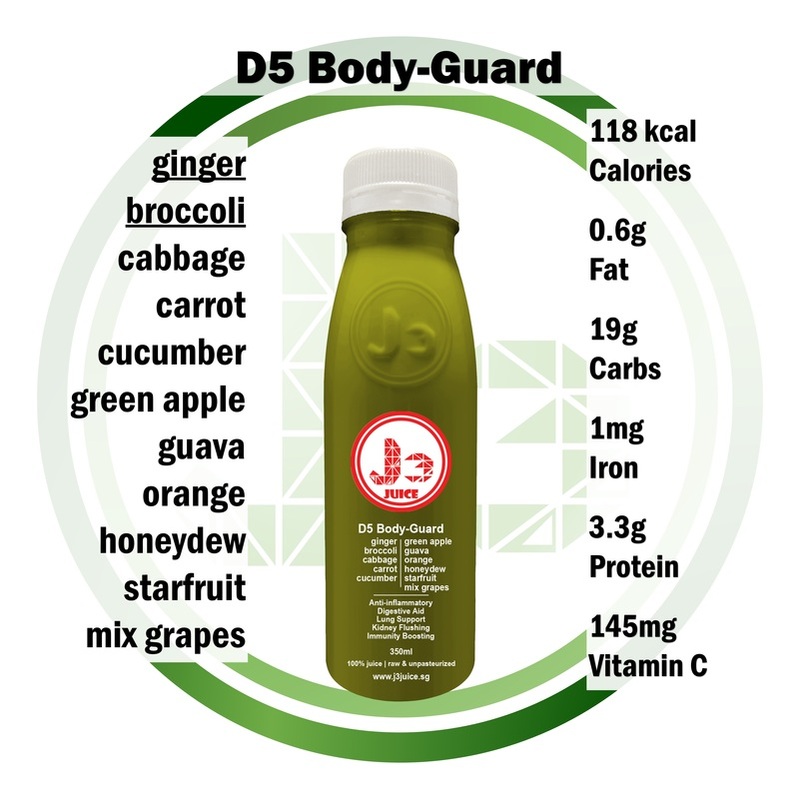 Ingredient also include: honeydew, cabbage, orange, guava, carrot, cucumber, mix grapes, starfruit and green apple. Green and gingery with the refreshing taste from green apples and orange. 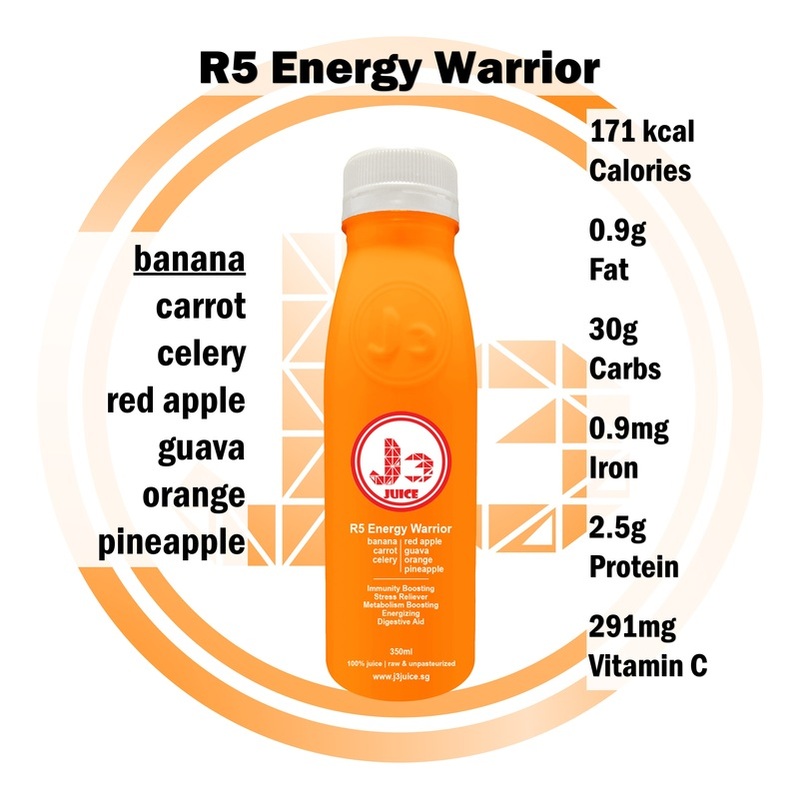 Ingredient also include: celery, honeydew, red apple, carrot, dragon fruit, green apple and orange. Taste: Slightly deeper and earthier taste with sweetness from red apples. Ingredient also include: cabbage, pear, blueberry, strawberry, cucumber, carrot, orange, guava and green apple. 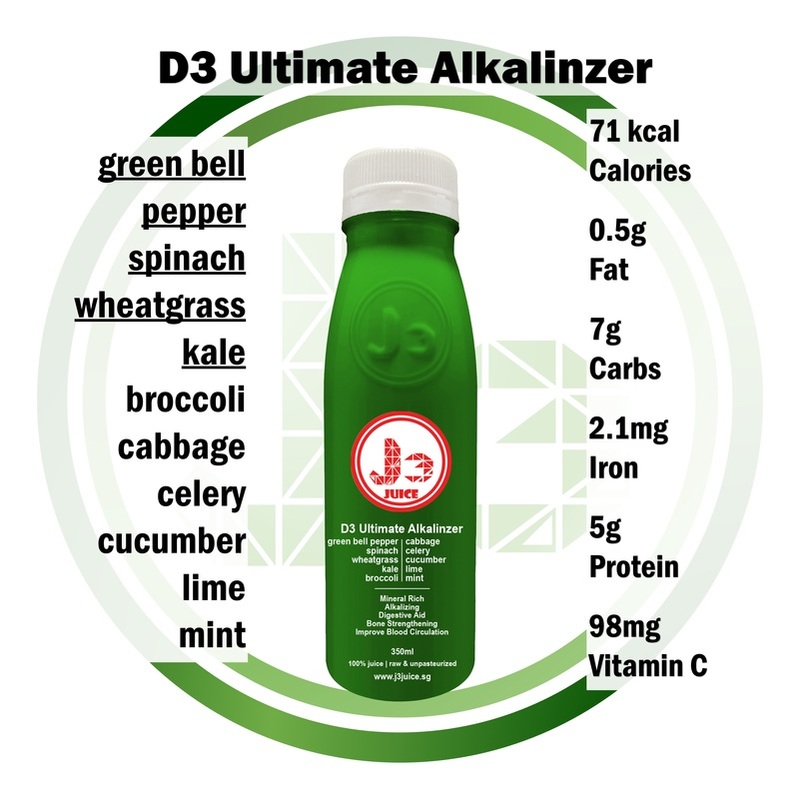 Taste: Green with refreshing taste from pear, green apples and orange. Ingredient also include: pineapple, cucumber, pear and lemon. 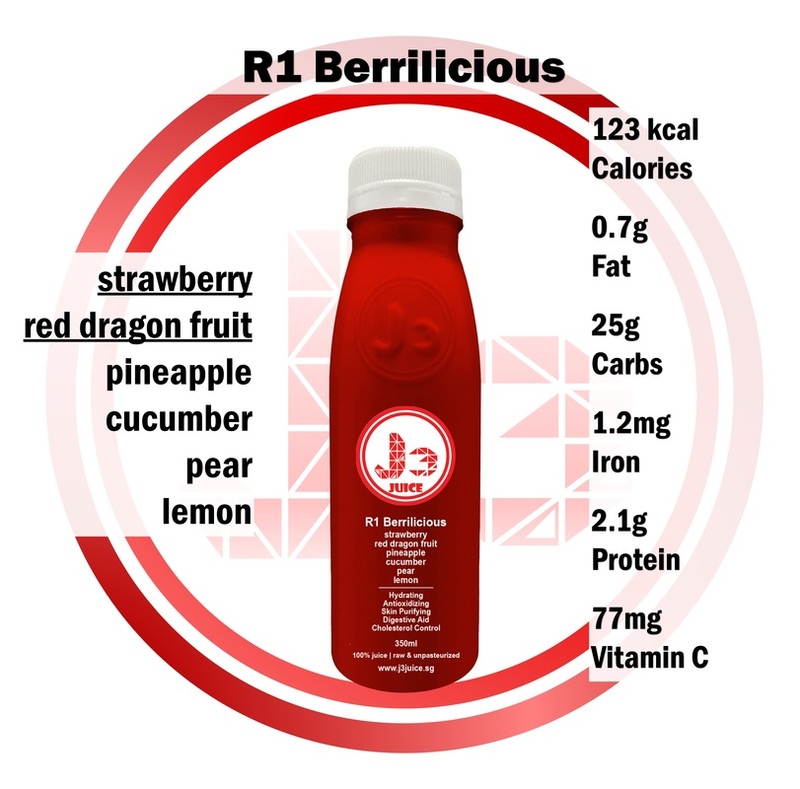 Taste: Berrilicious, light and refreshing. Ingredient also include: red apple, orange and lemon. Taste: Sweet and sour with a pinch of ginger and lemon. Ingredient also include: orange, red apple and lemon. Taste: Sweet and a slight aftertaste of bitterness from grapefruit. Ingredient also include: pear, pineapple, lime and orange. 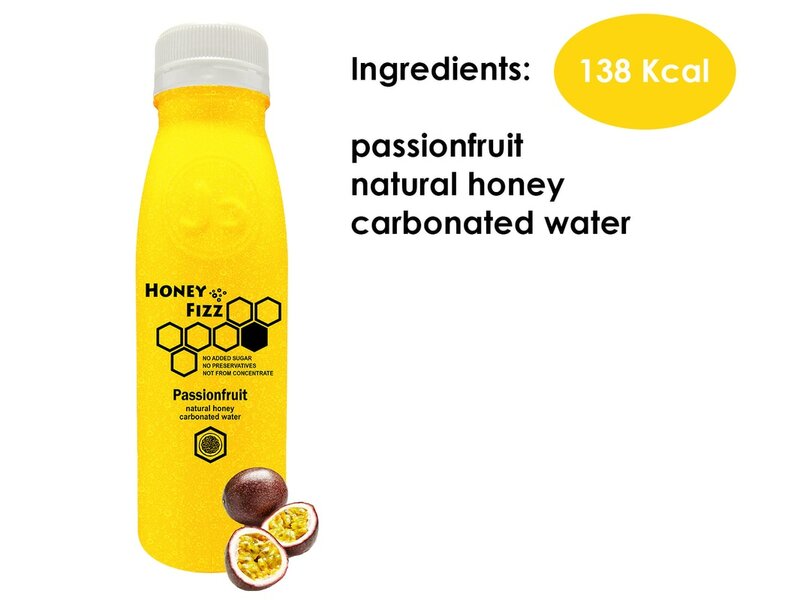 Taste: Sweet and sour with the fragrance of passion fruit. 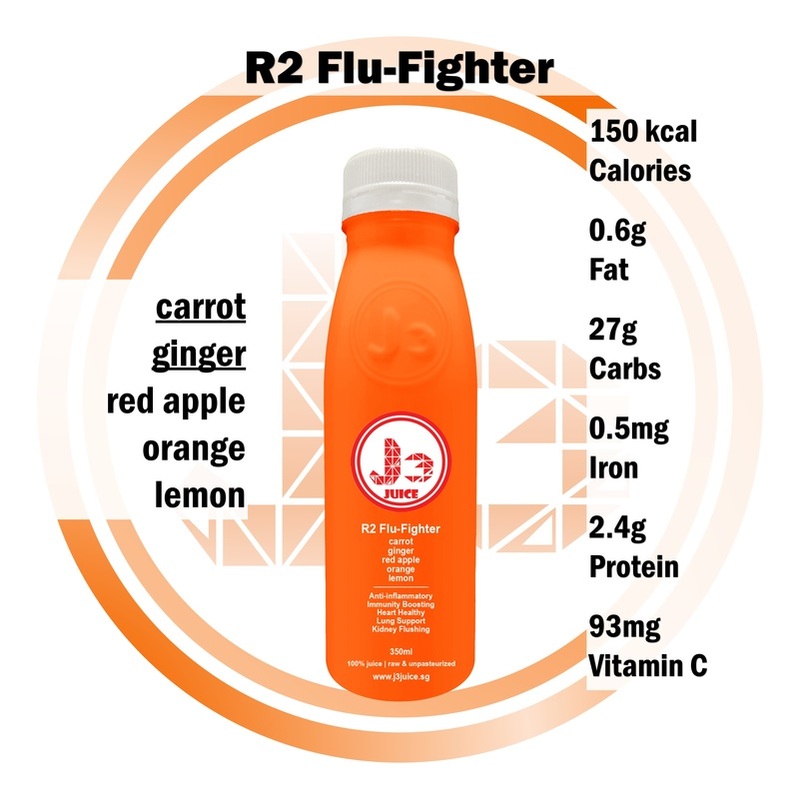 Ingredient also include: pineapple, red apple, orange, carrot, celery and guava. Taste: Sweet and smoothie like texture. Ingredient also include: green apple, guava, lemon and celery. Taste: Sour and refreshing with a pinch of lemon. Ingredient also include: pear and lemon. Taste: Light refreshing with a pinch of lemon. 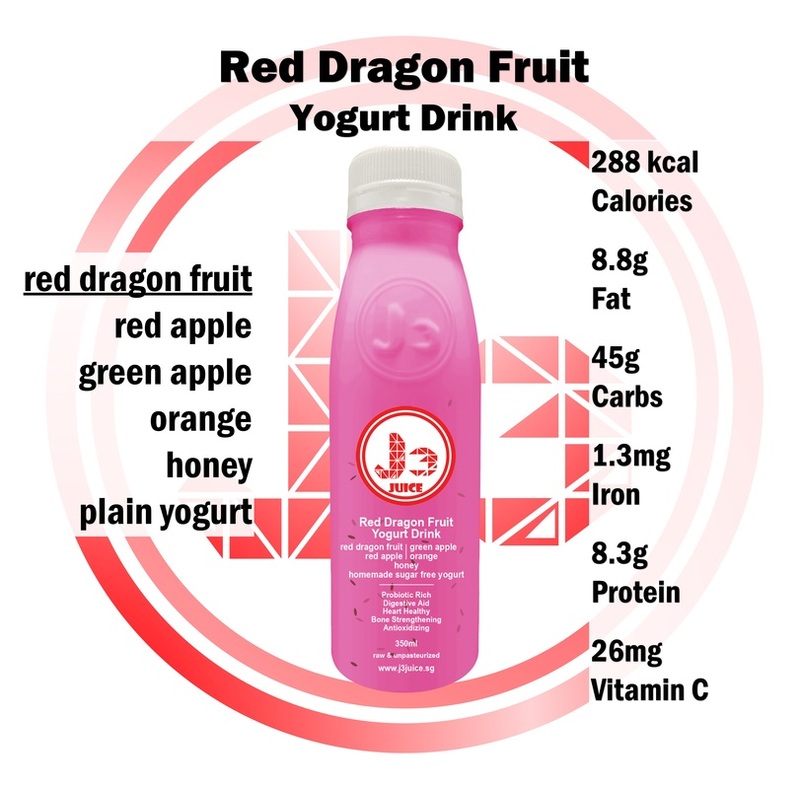 Ingredient also include: red apple, green apple, lemon and sugar free homemade plain yogurt. 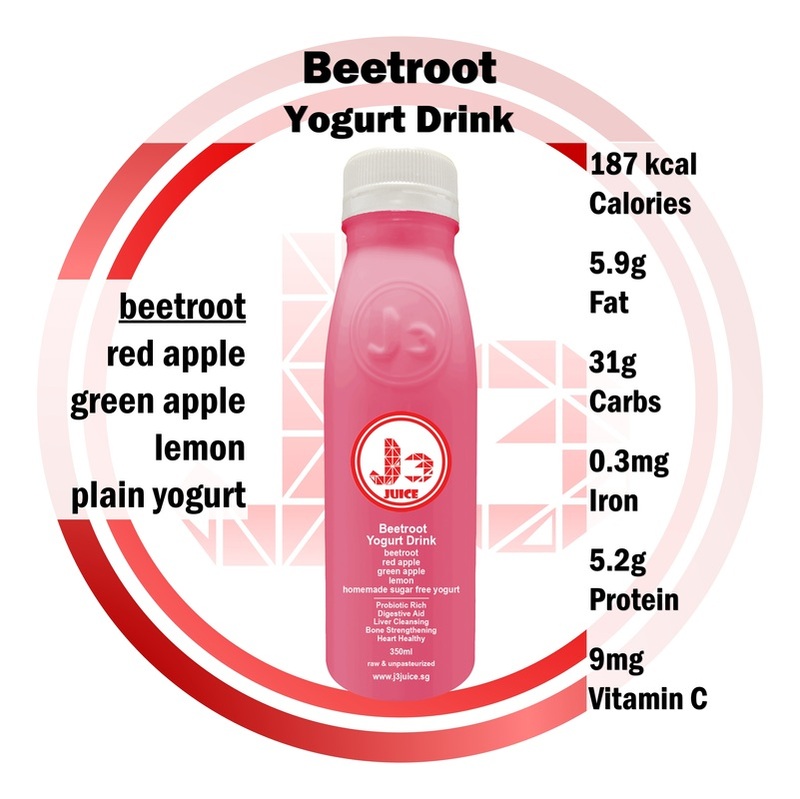 Taste: Sweet and smoothie like texture, with a pinch of beetroot. 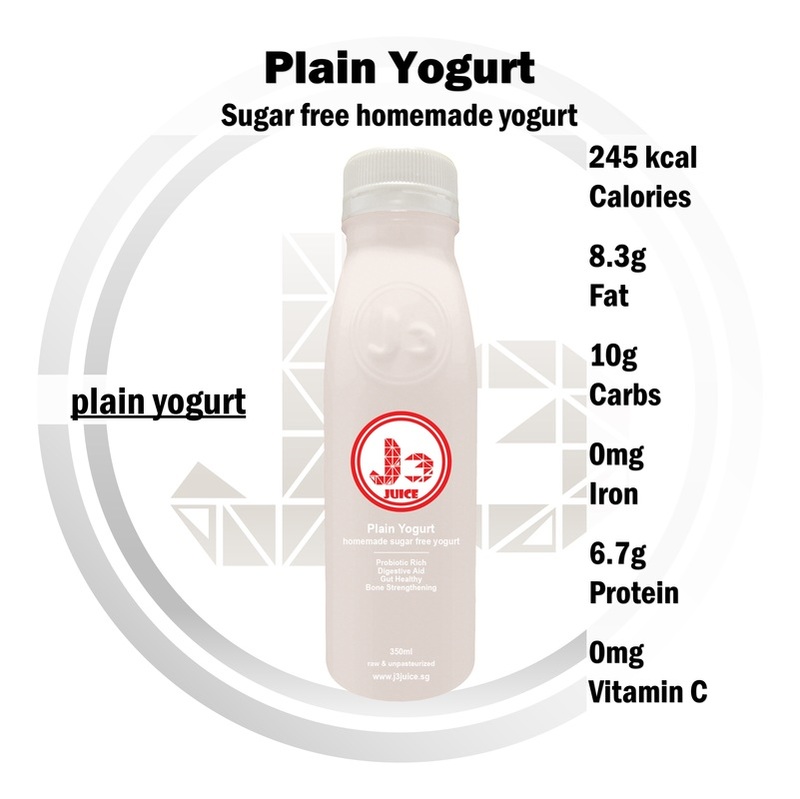 Ingredient also include: red apple, green apple, orange, honey and sugar free homemade plain yogurt. Taste: Sweet and smoothie like texture, with bits of hand pressed red dragon fruit flesh. 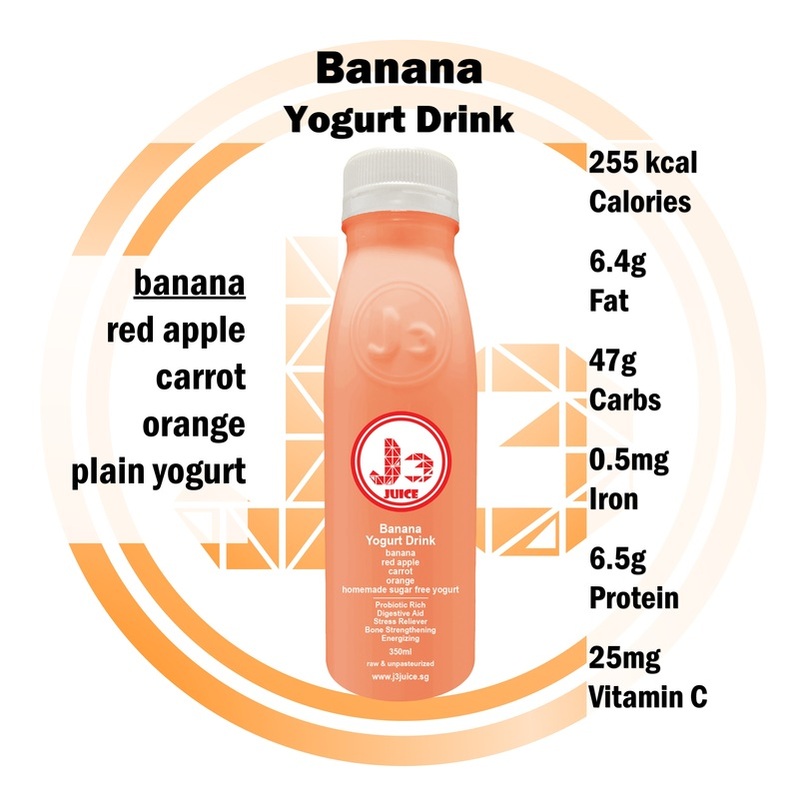 Ingredient also include: red apple, carrot, orange and sugar free homemade plain yogurt. Taste: Smoothie like texture with sweetness from banana. 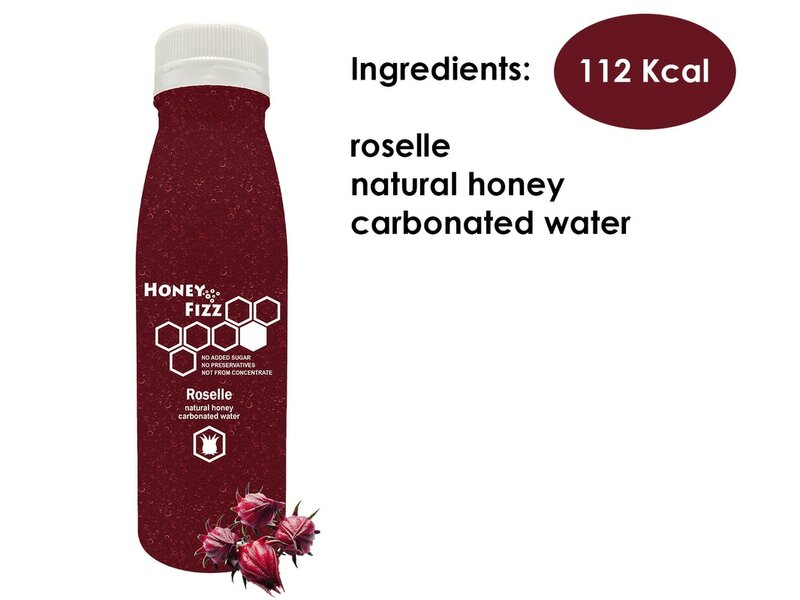 Ingredient also include: guava, honey and sugar free homemade plain yogurt. 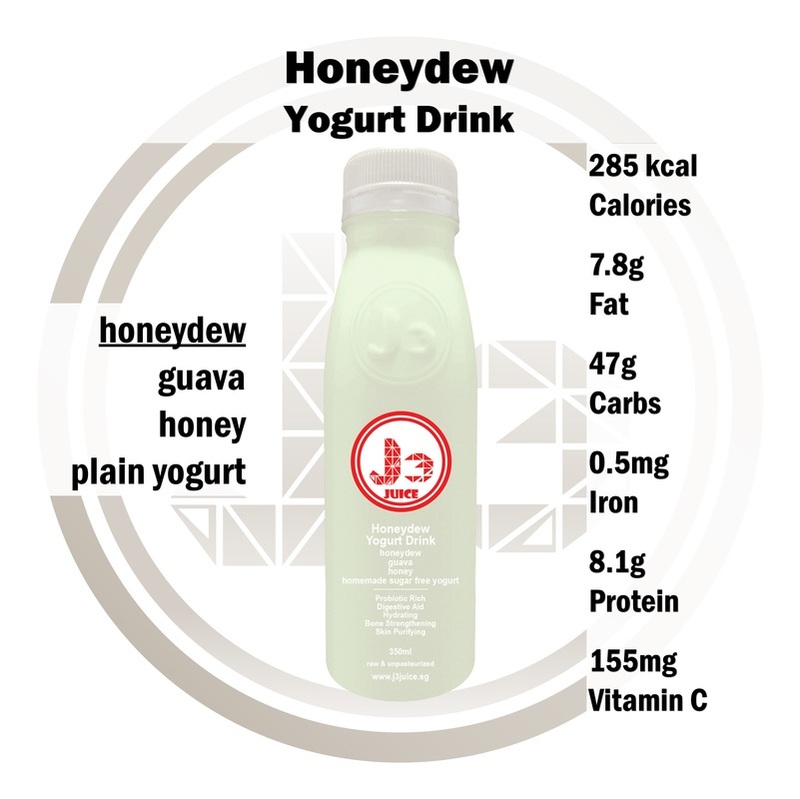 Taste: Sweet and smoothie like texture, with the fragrance of honeydew. Taste: Sour and smoothie like texture, filled with the fragrance of the milk. 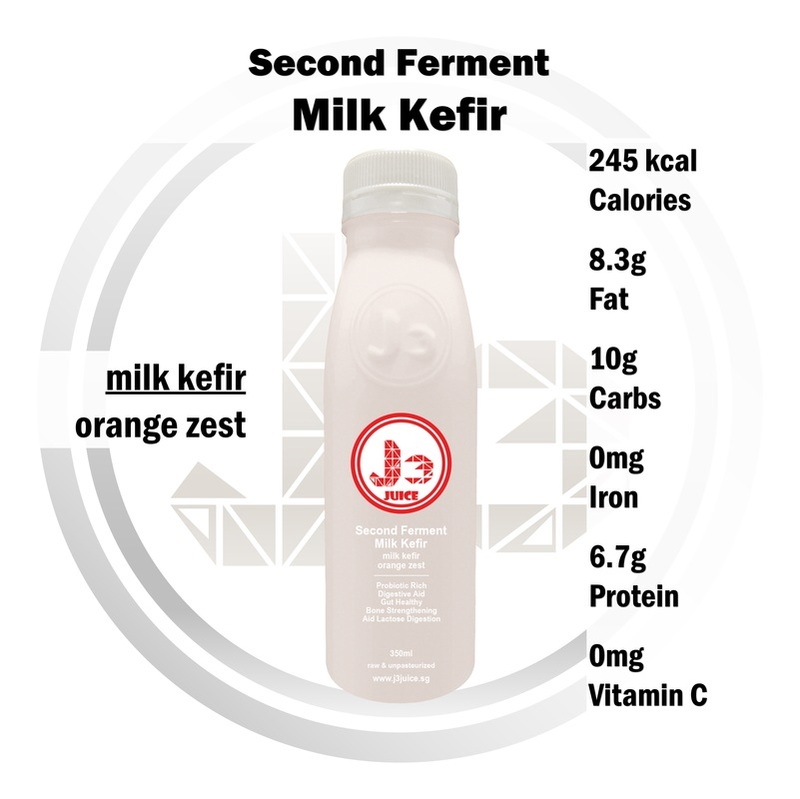 Milk Kefir can be traced back over 1000 years ago to the Caucasian Mountains. It is a fermented diary product that is high in nutrients, beneficial yeasts, enzymes and lots of powerful probiotics. • Milk Kefir has strong antimicrobial properties where some probiotic strains that it contains are able to completely inhibit Candida and harmful bacteria such as Salmonella, E.Coli, Shigella, H. Pylori and Staphylococcus aureus among many others. Hence it is beneficial to the gastrointestinal/gut system. • Probiotic bacteria in Milk Kefir helps people with allergies (include food allergies) as it can help to prevent the absorption of some antigens that causes allergies by strengthening the barrier function of the intestinal wall. • Milk Kefir is able to regulate cholesterol, blood pressure and blood sugar level. It also has the ability to reduces constipation. • Milk Kefir made is an excellent source of calcium. 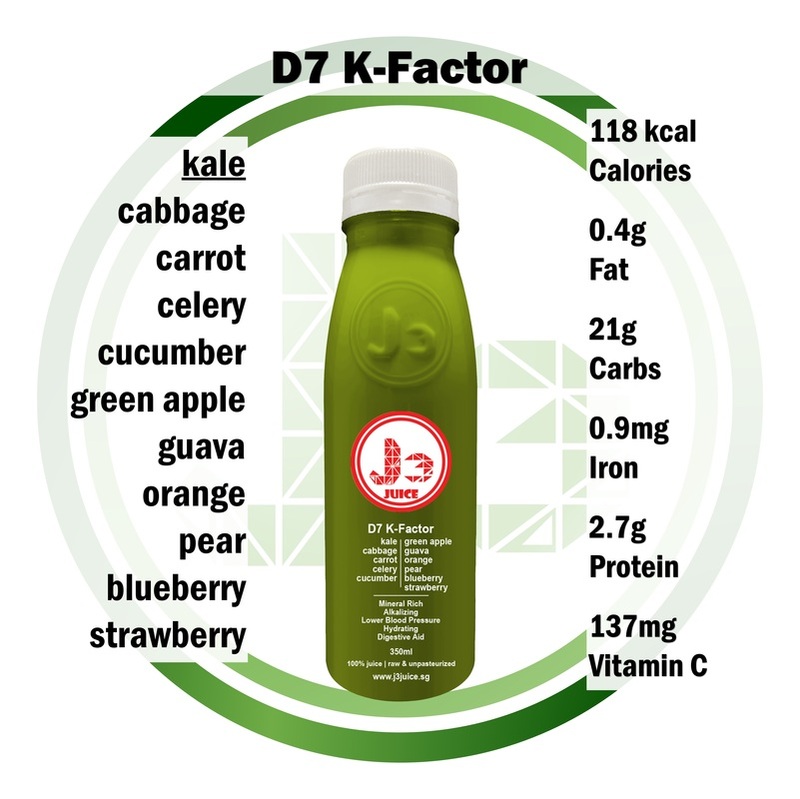 It also contains vitamin K2 which can increase calcium absorption by bone cells. This leads to improved bone density, which should help prevent fractures. 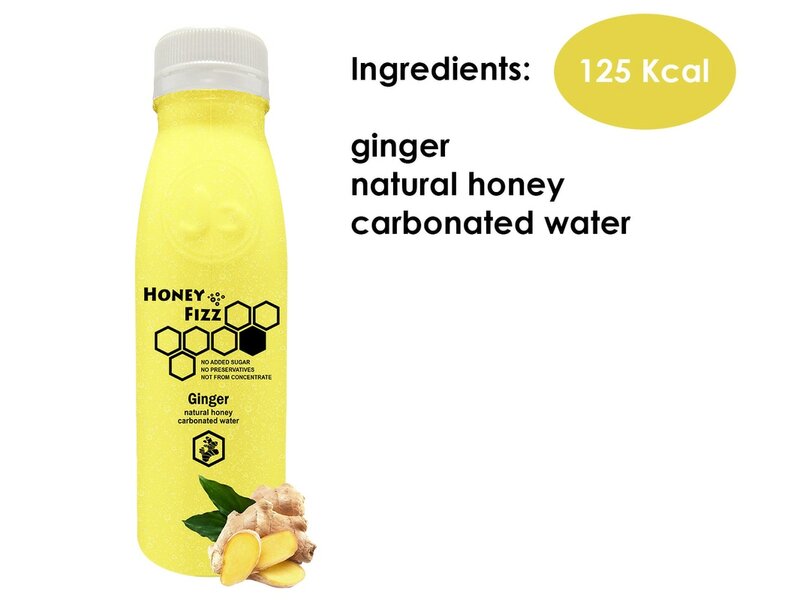 • Milk Kefir’s bacteria are able to super boost the immune system to fight pathogens and to slow down the conversion of carcinogenic (cancer causing) compounds to carcinogens (cancer). Hence it has the ability to prevent and treat cancer. 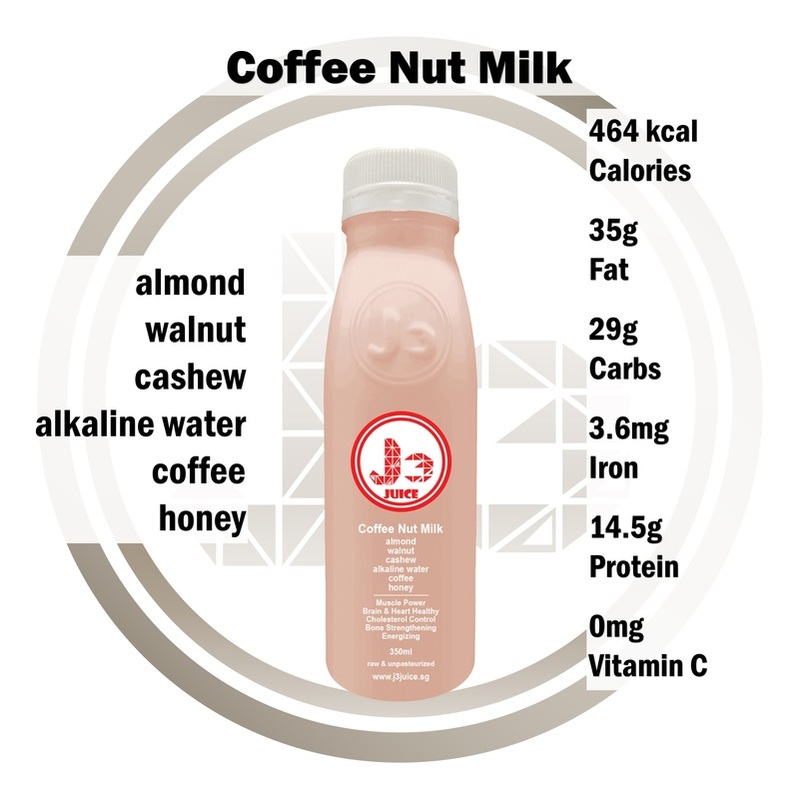 It contains no milk. Suitable for lactose intolerant. 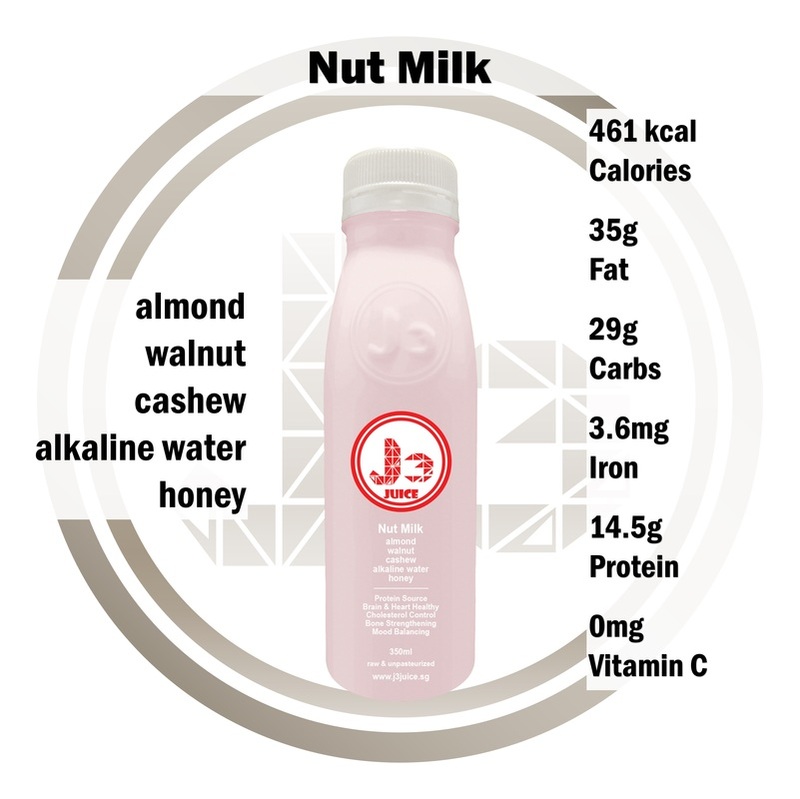 Contains close to 100 raw nuts per bottle with no artificial almond flavoring. 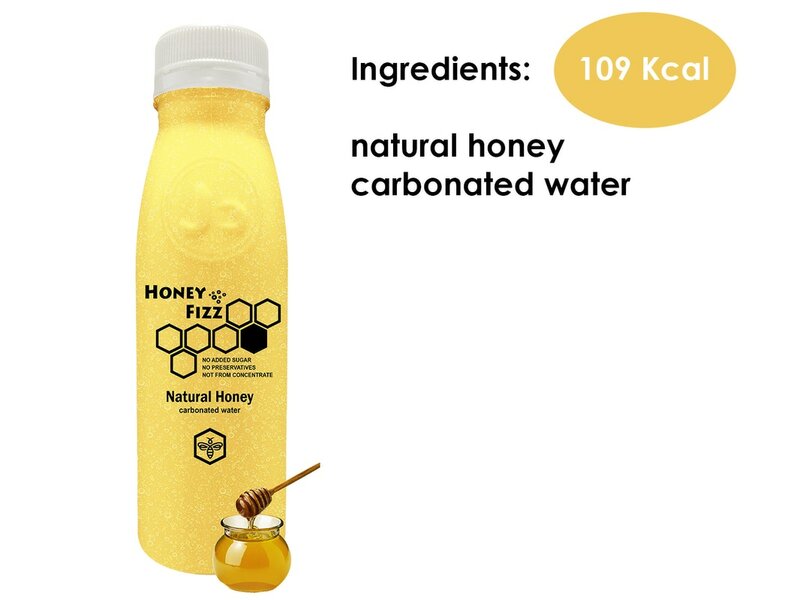 Taste: Creamy with slight sweetness from honey. Tell us what you like most! Copyright © 2019 J3 The Group LLP.